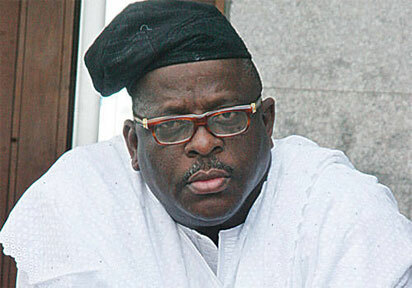 The ongoing PDP Convention "Elective National Convention of the Peoples Democratic Party, PDP " experienced a mild drama when Senator Buruji Kashamu, Ogun East was chased out of the Stand of his state. Senator Kashamu who was dressed in white kaftan, shinning blue shoes and dark glass to match who arrived at the Ogun state Stand, was welcomed with shouts of go away and to respect himself, he left with his supporters. To find refuge, the Senator went to the next stand which is Ondo, but the delegates there also drove him away. Senator Buruji Kashamu finally got accommodated by the Osun State delegates where he sat in between the former National Secretary of PDP, Professor Wale Oladipo and Senator Felix Ogunwale. Earlier in the day, there was a similar scenario at the Ekiti Stand when delegates shouted at another delegate who was already sited to stand up and leave the stand. The Ekiti delegates who are apparently loyal to the governor, Ayodele Fayose went to a serving member, Ekiti State House of Assembly, Honourable Oni Olamide, Ijero/ Ekin / Efon constituency who was already seated, tried to drag him out, but he resisted it.